The tender young leaves from these fast-growing plants can be eaten raw, or cooked for soup or stir fries. Very cold hardy, harvest can continue right through snow. Many colored varieties are a fine addition to ornamental plantings as well as spectacular garnishes. Prefers full sun in spring and fall, but can benefit from light shade during hot weather. Depends on variety. Those with savoyed leaves tend toward the fine end of the spectrum. Older plants with smooth leaves can be coarse. Similar to cabbage and other cole crops, you can also set out transplants in spring 4 to 6 weeks before average last frost, 12 inches apart, rows 18 to 24 inches apart. Doesn't seem to be as troubled by pests as most other cole crops. Use floating row covers to help protect from early insect infestations. 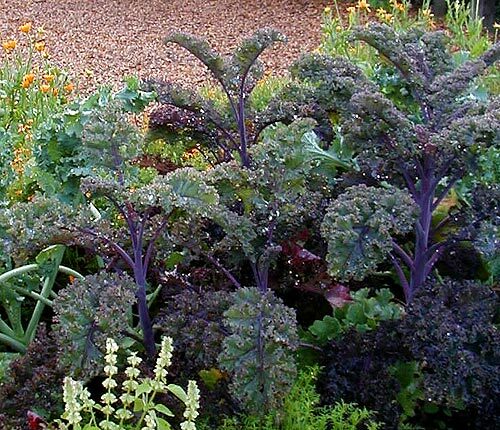 Browse kale varieties at our Vegetable Varieties for Gardeners website. Look for different colors, days to harvest. Some varieties have curly or savoyed leaves resembling parsley. Colorful ornamental varieties tend to be less flavorful. 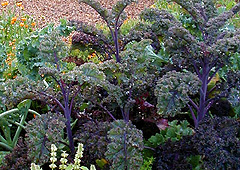 Red Russian kale is a different species, Brassica napus var. pabularia, but cultivated similarly.